OK, now that I’ve waxed all poetic and hippie-like, it’s time to get down to the practical nuts-and-bolts of why I am here: to relay a healthful veggie stir-fry recipe that will help to cleanse our bodies from all that rich winter comfort food we’ve been eating for months. As enamored as I am with hearty soups, I realize that they have to stop at some point (maybe – I have a great sausage, spinach, and barley one that I road-tested a month or two ago and wouldn’t mind bringing to you guys here before it gets too warm!). And I am really looking forward to all of the fresh lovely local produce that will be coming out soon – like corn (organic, to ensure there are no GMOs!) and tomatoes – and watermelon. And basil! Loads of fresh basil! Caprese salads YES!!!!!!!! I’m pretty sure none of the vegetables in this stir-fry were locally grown (maybe if I had thrown some asparagus in . . .). Still, it has a decidedly spring feel to it. It’s also pretty spicy, per my preference for the hot stuff. 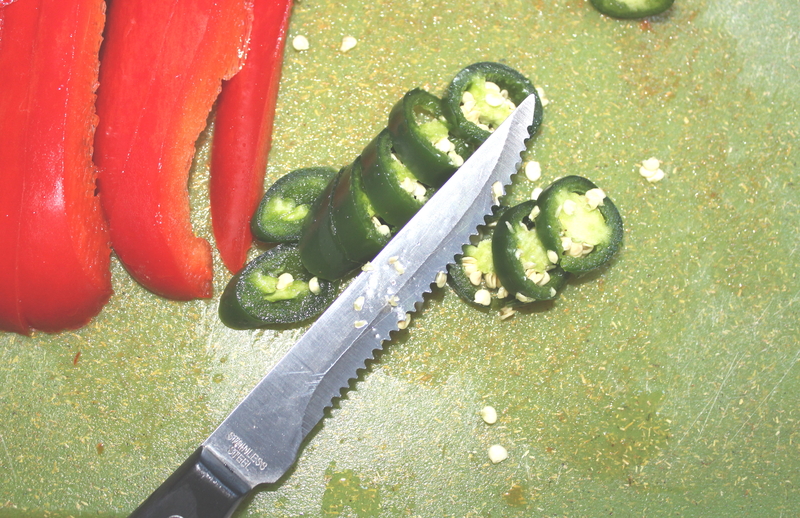 I did remove the seeds from the jalapeño – and you can also nix the cayenne pepper and/or reduce the amount of curry powder you use if you are wanting less of a kick. 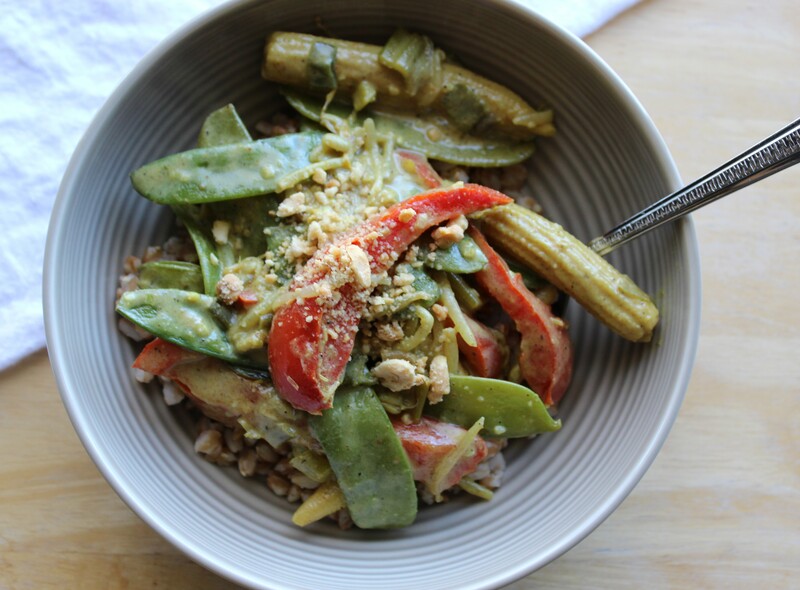 The coconut milk is so nice in itself, and the lemongrass paste and ginger lend great vibrancy, so you really don’t need to add too much curry for this to be flavorful. Let’s talk about the lemongrass paste for a moment. 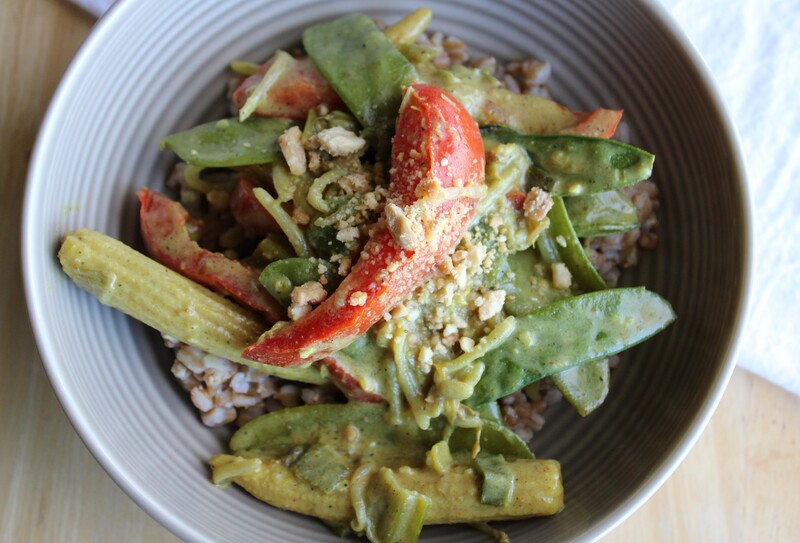 When I created Draft 1 of this recipe, I used actual lemongrass stalks. I minced them up like I saw done in an online video and threw those bad boys into the fray. PLEASE don’t do this. OK, I’m no lemongrass aficionado, so I can’t be sure that all lemongrass is like this, but the stuff I had was so dried and so tough and so inedible, like choking on the driest of dried hay. I would not recommend cooking with actual lemongrass – unless it is something you – unlike me – are experienced in doing. I believe you could effectively throw in whole pieces of lemongrass and let them marinate the veggies as they cook and remove them at the end, but if you are able to find lemongrass paste, that would probably be the easier choice. I found mine in the produce section at my local supermarket, near the herbs. It’s so finely pureed that you can squeeze it right into your stir-fry and eat it just like that – and you won’t have to worry about choking on indigestible shards of it. Another fun factoid about this recipe: I substituted farro grains for rice. If you’ve been around the blog before, you may be familiar with farro in the use of some of my other recipes (such as one of my absolute favorites, Pine Nut and Parsley Pesto with Grape Tomatoes and Italian Farro). It’s a great substitute for rice and pasta. It serves up double the amount of protein that brown rice does (six grams in a one-fourth-cup dried serving versus three grams), plus triple the amount of dietary fiber (three grams as opposed to one gram), meaning it’s more nutritious and filling than rice. Plus, it has a great chewy texture. Give it a try if you’ve never had it – you’ll be hooked! (Serving-related note: you may want to increase the amount of farro you make here if you prefer a higher ratio of grains to veggies. There won’t be as much farro to go around with the amount I’ve given in this recipe if you break this into five servings, per the four-to-five-serving yield of the veggie stir-fry). Cook farro according to package instructions. For me this time around, that meant adding the farro and water or broth to a medium pot, bringing it to a boil, then reducing the heat to a medium-low simmer, covering, and letting cook for about 20 minutes, until the texture is chewy and all of the liquid has been absorbed. 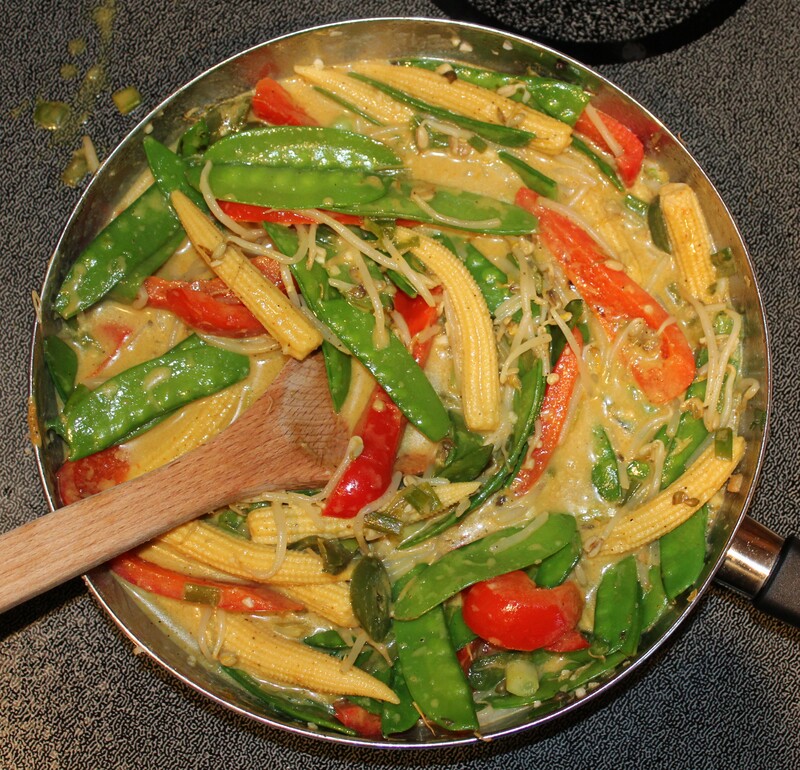 To a large frying pan or wok over medium heat, add the sesame oil, baby corn, bell pepper, pea pods, and jalapeño. Saute for about seven minutes, stirring frequently. Add the bean sprouts, green onion, garlic, and ginger and let cook for another two minutes. Then stir in the coconut milk, lemongrass paste, and spices; reduce the heat as necessary, and let simmer for an additional three to four minutes. Once done, serve over a bed of the farro grains and garnish with crushed peanuts. Yum-my! Makes about four to five servings.